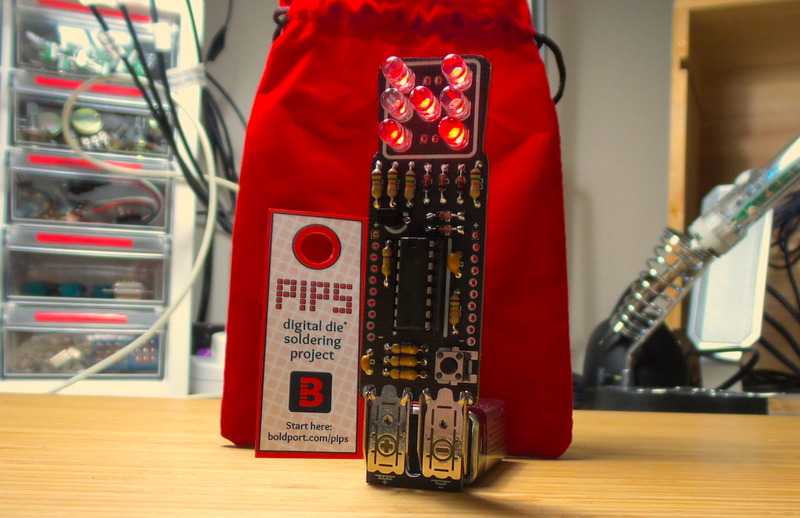 The BoldportClub Pips circuit is based on “Dicing with LEDs” by Elektor (December 2006), but with a new PCB designed as only Boldport can (and a flashy red baggie). The ripple counter toggles through all die states at around 8.8kHz. Diode steering is used to light the appropriate LEDs for each state and reset the count when it gets to “7”. This runs fast enough that it appears all LEDs are on at the same time. hen the button is pressed, the counter stops - this is a “roll”. This is a similar concept (but quite a different implementation) to the LEAP#229 Dice project, which uses a 555 and CD4017 to also achieve a slow-down effect.